April | 2010 | 50 Westerns From The 50s. 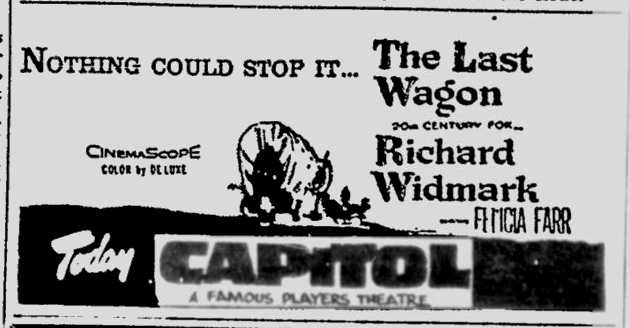 Last night, someone brought up Delmer Daves’ The Last Wagon (1956), which made me think of Richard Widmark tied to the wagon wheel. It’s one of those movie images that has really stuck with me over the years — in a movie that’s tough and brutal and well-paced. All the stuff you want in a 50s Western. Oh, and it’s got Timothy Carey in it. Enough said. Further proof that 1956 was the year for Westerns. 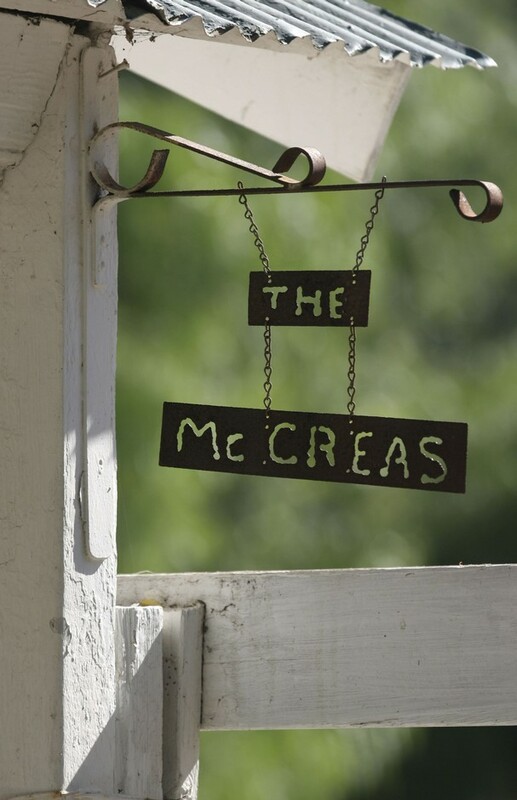 Be a guest of The McCreas. It doesn’t take much time on this blog to figure out I’m a huge Joel McCrea fan. So it’s big news around here that Joel McCrea’s Thousand Oaks ranch is not only on the National Register Of Historic Places, but that the 90-year-old home will be preserved as a visitors center. It should be ready for tours in about a year. Joel McCrea bought the ranch in 1933, and he and Frances Dee called it home till his death in 1990. Over the years, according to McCrea’s wishes, pieces of the ranch have been donated to the YMCA and other groups. You can read more about the ranch and the plans for it here. I came across this wonderful bit of news through Laura’s Miscellaneous Musings. Thanks, Laura. Broken Arrow (1950) is often held up as the first postwar film to sympathetically portray Native Americans. It came out within weeks of Jimmy Stewart’s other 1950 Western, Anthony Mann’s Winchester ’73. But Broken Arrow and its writer(s) have another distinction. The “Apache Wedding Prayer” recited in the film must’ve really resonated with people, because it’s been used in actual weddings over the years. Do these happy couples believe they’re adding a beautiful Native American tradition into their nuptials? Or do they realize they’re quoting an old cowboy movie written by a suspected Commie? You know, I can completely understand why someone would want to incorporate that into their ceremony. Gunfight At The Real O.K. Corral. I found this quite interesting, especially since I’ve been working on a post about the various Earps and Hollidays we were treated to in the 50s. Enjoy. Arizona Court Discovers Original O.K. Corral Papers. PHOENIX — A missing handwritten transcript from a coroner’s inquest done after the legendary gunfight at the O.K. Corral has resurfaced in a dusty box more than 125 years after the most famous shootout in Wild West history. 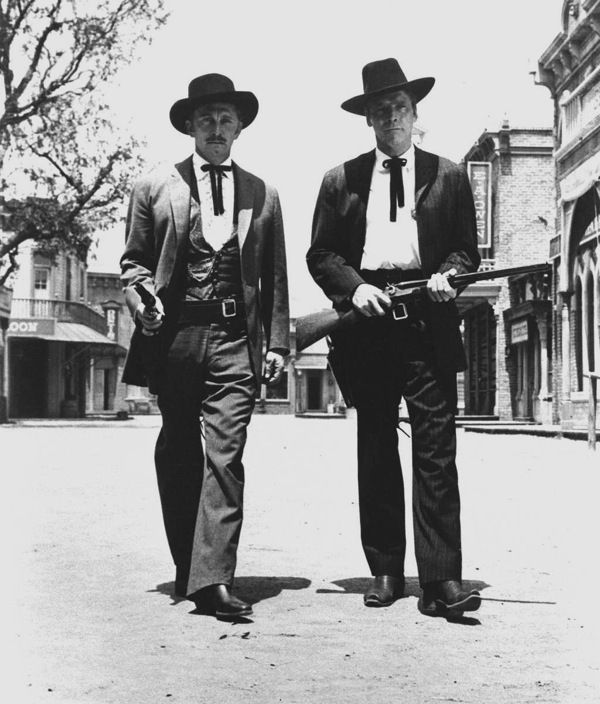 It made folk heroes of Earp and Holliday and inspired numerous movies (such as 1957’s Gunfight At The O.K. Corral, above) about the untamed Old West. Officials showed off just one page of the transcript on Wednesday — a thick sheet of paper with blue lines and sloppy cursive writing in dark ink. It appeared to contain the beginning of testimony by William Claiborn, identified by a historian as a friend of the three dead outlaws. “I was present on the afternoon of Oct. 26th ’81 when the shooting commenced between outlaw parties,” the testimony reads. 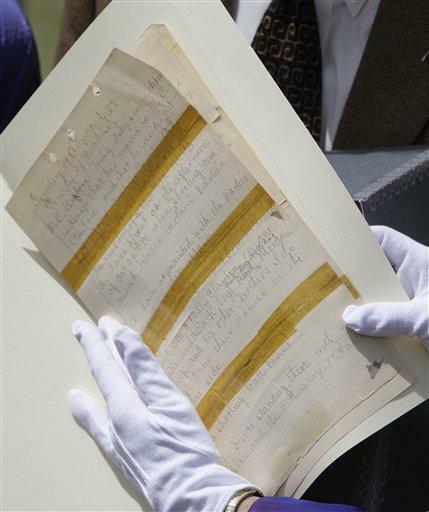 Even if the document doesn’t reveal new information, the discovery helps historians feel more comfortable with the record, said Gary Robertson, a Wild West historian and author of the book Doc Holliday, the Life and the Legend. But most importantly, it sparks the imagination. Copyright 2010 by The Associated Press. Western Stars Under Eastern Stars. 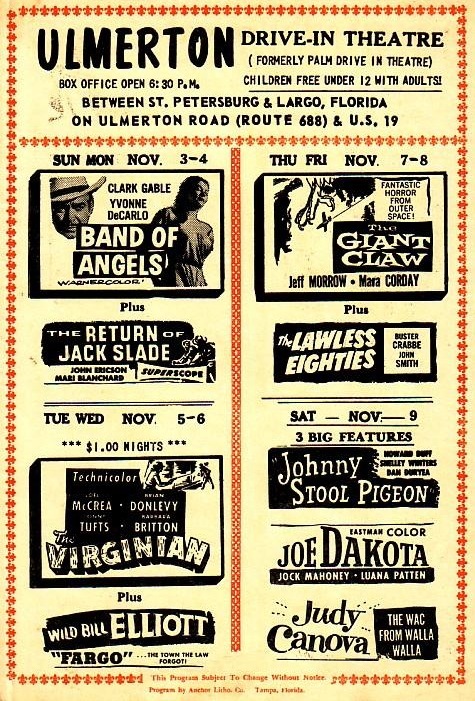 The first week of November, back in 1957, was a good one at The Ulmerton Drive-In Theatre (formerly The Palm) near St. Petersburg, Florida. A Western every night of the week. Dig the Joel McCrea/Bill Elliot double bill, The Virginian (1946) and Fargo (1952), for just a buck a car! 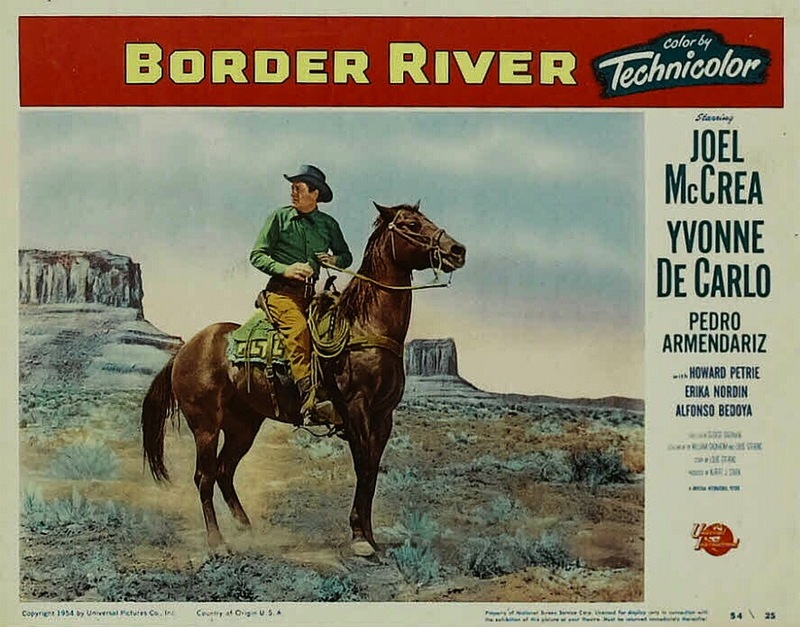 Carlson also directed a handful of films and TV, including a couple of pretty good Rory Calhoun Westerns for Universal-International. 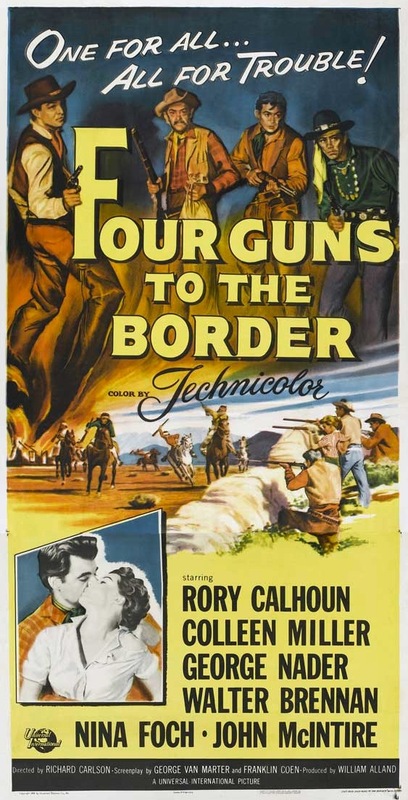 First was Four Guns To The Border (1954), which rounds out the cast with Colleen Miller, Walter Brennan and John McIntire. 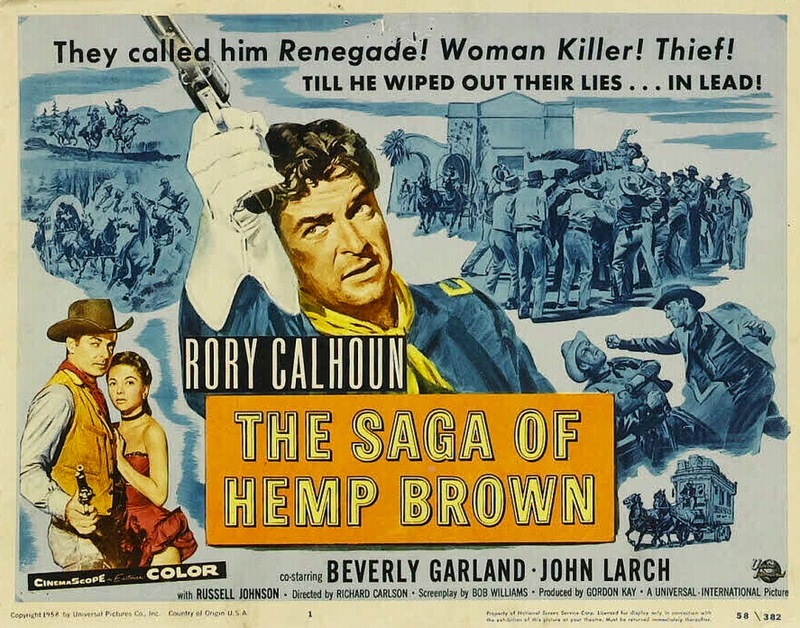 Next came The Saga Of Hemp Brown (1958). Carlson’s got another great cast riding along along with Rory: Beverly Garland, John Larch and Russell Johnson. And CinemaScope, too. I love these U-I posters and wanted an excuse to post a couple. What are our chances of seeing this stuff on DVD in our lifetime? And speaking of Universal-International Westerns (and The Creature), Julie Adams was in a ton of ’em, such as Anthony Mann’s Bend Of The River (1952) and Budd Boetticher’s Wings Of The Hawk (1953). 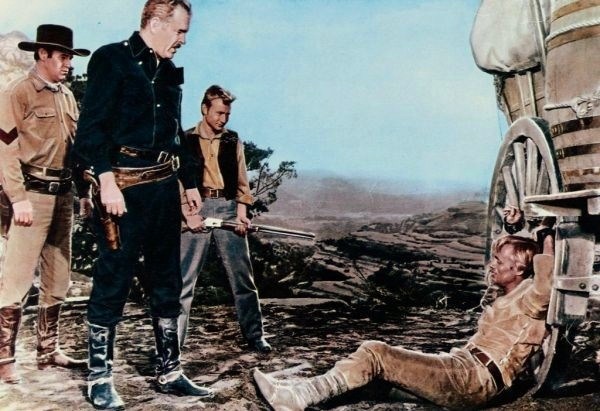 When I started working on 50 Westerns From The 50s, and the blog that goes along with it, I made a decision to stay away from TV Westerns. Nothing against them, I just didn’t want to take on too much (and to be honest, I don’t know all that much about them). 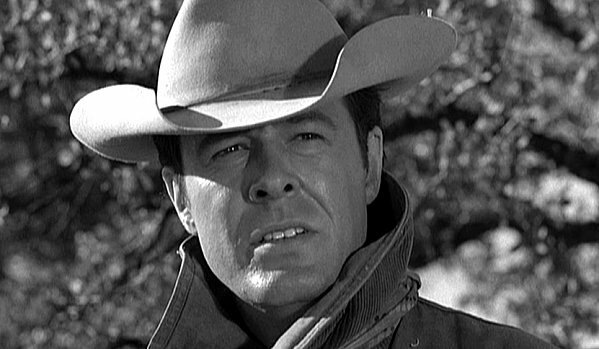 But I’m gonna make an exception with Robert Culp. Mainly because I like him. And because I was inspired by Stephen Bowie’s terrific piece on him at The Classic TV History Blog. Go read it. Culp never appeared in a Western feature in the 50s (at least none that I know of), but he did a lot of Western TV — including The Rifleman, Bonanza, Zane Grey Theater and two seasons of Trackdown (which he starred in, and is unavailable on DVD). There’s also a particularly good Rawhide episode, “Incident At The Top Of The World,” with Culp excellent as a Civil War veteran addicted to morphine. He was good. He was cool. And he will certainly be missed.